If you don’t believe cash is king take a look at some of the companies who have the largest cash reserves. Topping the list is Cisco with almost $40 billion in cash. Microsoft has nearly $37 billion, Pfizer $27 Billion, and Apple stands at $25.6 Billion. Why do these companies have such large amounts of money in cash? If a company is having trouble with cash, nothing else matters. Having cash provides your company with the oxygen it needs to grow and thrive. It provides options. I’ve personally seen the tension and anxiety that cash flow difficulties can have on a business. The CEO, controller and often times the sales department runs around like a chicken with it’s head cut off working at making sales and anything they can do to bring cash into the business as quickly as possible. At the Mastering the Rockefeller Habits Four Decision Workshop we’ll spend a segment of time focusing on cash and working through a Cash tool that can help you improve your cash flow, in some cases dramatically. My September newsletter offered an example of a client who not only discovered how he could increase cash flow but also “Discover Your X Factor” which provided a 10x advantage for him in his market. 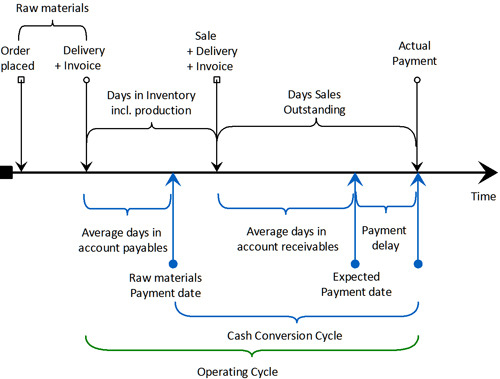 What exactly is the Cash Conversion Cycle? Cash Conversion is defined as the amount of time it takes from when you spend $1 until you make that $1 back. How long from when you spend money on your product or from when you pay for your services does it take for you to collect the money you spent? Most companies look only at the billing and payment component in an attempt to improve their cash position. 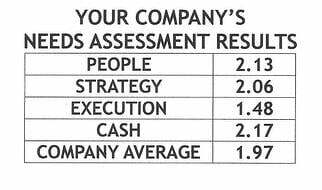 This is a mistake of enormous magnitude since any of the remaining three components can deliver as much impact, if not more to improving cash flow in your business. Think about it, if your sales process delivered more sales and shortened the time frame in which it took to turn sales into cash, wouldn’t that be of great value to your business? Would it not be the same for your business if you could shorten the time of your delivery and production of your product or service? If the inventory you carried turned into cash more quickly, or if you only stored those items that turned into cash fastest, wouldn’t that have a critical impact on your business? An Acupuncture Doctor we worked with for a short time sold herbal medicines to his customers. Each month they would sell somewhere $3 - $4,000 in herbal remedies, yet his staff had accumulated almost $100,000 in herbal inventory in expectation of their customer’s needs. No one was monitoring the system to realize how much over stock they had. The vendors who called on him were taking advantage of his success by continuously stocking his shelves with product he wouldn’t need for months. He desperately needed an effective inventory control system to reduce the excess products he was carrying which were having a severe impact on his cash flow. Will provide examples of how companies, including Dell Computers, have used each of these strategies at Mastering the Rockefeller Habits Four Decision Workshop to increase their cash flow, some in dramatic fashion. The beauty of most of the ideas generated is they come from collective intelligence; the result of you and your staff simply sitting down and brainstorming ideas. This is another element we’ll provide details on at the Mastering the Rockefeller Habits Four Decision Workshop. Structuring meeting agendas in Strategic Discipline takes advantage of the enormous brain power in your team. Your people are in many cases already aware of steps that can improve the system. They may be just waiting for the opportunity. The group collectively will provide possibly more ideas then you can harvest. Choose those that make the most impact and can be immediately put into place. You’ll be delighted with the outcome when you begin to see your cash flow increasing. One last observation. Consider developing a dashboard to monitor your cash flow in your business. However you monitor this, cash is the lifeblood of your business. It needs to be watched closely in order to provide the life giving nutriments your company needs to survive and thrive! Next blog why you can be assured Strategic Discipline guarantees success for your business, a quick review of my personal journey.